You’re at the foot of the Buhlführe trail at the Maukspitze in the Wilder Kaiser mountain range and feeling uneasy. You look up at the historic alpine route, where in 1943 mountain climbing legend Hermann Buhl solved one of the greatest climbing problems in the Eastern Alps. To this day the tour remains one of the great alpine classics: barely secured with demanding intersection and chimney climbing. You don’t have a heavy backpack with you – just the essentials. But for this type of expedition in particular you should always have a first aid kit with you. Because these can save lives in an emergency. ORTOVOX developed the ROCK DOC for just this kind of alpine adventure. The ROCK DOC is a combination of chalk bag and first aid kit especially for alpine climbers. The chalk bag can be adjusted as required using a cord system. The soft inner material and the large opening mean you can quickly grab what you need. There is a first aid compartment on the side. 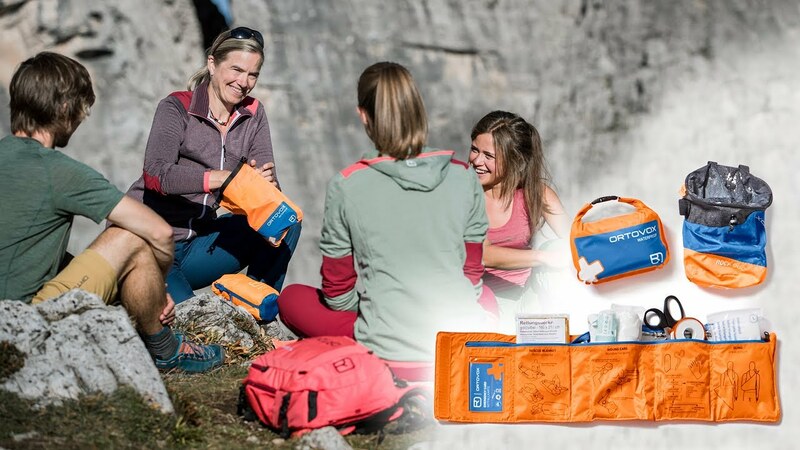 The contents are completely adapted to climbing: From the emergency card, through compresses and gauze bandages, a plaster set, butterfly closures, and a small pair of scissors to disposable vinyl gloves – there’s space for all of this alongside your chalk in the side compartment. Since ORTOVOX was founded we have been developing emergency products – characterized by our alpine origins. That’s why we know how essential the correct equipment is in both summer and winter. The bag has a SOFT LINING and a wide opening for the EASIEST POSSIBLE ACCESS to chalk. The COMBINATION of CHALK BAG and FIRST AID KIT means tape et al. are always easy to access. In bright SIGNAL COLORS, the Rock Doc is particularly visible on the rock face from far away.